Maurice (539-602) - The last Byzantine emperor of the 6th century, he ruled from 582 until 602. Before becoming emperor, he was a prominent general in the military and his reign was marked by almost constant warfare; first against the Sāssānids and then the Avars. He concluded the war against the Sāssānid Empire on favorable terms (although another would break out almost immediately upon the conclusion of his reign), and succeeded in pushing the Avars back north of the Danube River. Although he was born in 539, virtually nothing is known of him before 577. In that year, he was appointed commander of the Byzantine army despite having no known military experience, and charged with winning the ongoing war with the Sāssānids. Whatever his experience, or lack thereof, he achieved a major victory against the Persians in 581. A year later, and perhaps as a result of this accomplishment, he married the emperor's daughter, Constantina. And in August of that year, he became emperor of the Eastern Empire upon Tiberius II Constantine's death, as the result of Constantine having no male heirs. He inherited an empire in shambles. It had no money as a result of its almost constant state of war, and its enemies had been encroaching on its territory for several years. Since the Sāssānid war was ongoing, he had no choice but to fight it. In 586, his army won another major victory at the Battle of Solachon. Two years later, the Byzantines won the Battle of Martyropolis. On the Sāssānid side, these setbacks led to the overthrow of Hormizd IV. In 591, the Battle of Blarathon ended in decisive victory for Maurice and brought about an end the war (until the next one). This final battle of the Sāssānid war involved deposing the Sāssānid monarch and placing Chosroes II on the throne (see Chosroes II below). 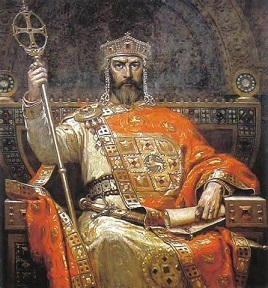 In return, Chosroes ceded western Armenia to the Byzantine Empire. With peace finally achieved on the eastern border, Maurice turned his attention to the Balkans. Both the Slavs and the Avars had been pushing south of the Danube and penetrating deeper and deeper into Byzantine territory. Maurice reassigned his military to the northern border with the goal of evicting these invaders. He succeeded, however, he did so by pushing his army to its breaking point. It chased the Avars, Slavs and Gepids north of the Danube. But in 602, in an attempt to keep them there, he ordered the army stationed north of the Danube for the winter. At the same time. the empire was still broke, and the troops received no guarantee they would be paid. They responded with a mutiny and lined up behind their general Phocas. He marched with them on Constantinople and overthrew Maurice. Phocas was proclaimed emperor and had Maurice executed in 602.